March 17 -- A new coal resource of 38.3 Mt has been reported for one of the principal projects in Mongolia, owned by unlisted Auminco Mines Ltd (Auminco), the subject of an agreed merger with Viking Ashanti Limited (ASX: VKA). Viking Ashanti announces the Indicated and Inferred coal resource estimate, classified in accordance with the JORC (2012) Code, for Auminco's 100% owned Berkh Uul coal project in northern Mongolia. The resource estimate, completed for Auminco by internationally recognised consultancy RungePincockMinarco Ltd (RPM), totals 38.3 Mt of which 21.4Mt is Indicated and 16.9Mt classified as Inferred for the Berkh Uul deposit. Berkh Uul is located 400 km north of Ulaanbaatar in northern Mongolia in the Orkhon-Selege coal district and within 20km of the Russian border (Figures 1 and 2). The project is 40km from rail access to domestic and Russian off-take markets, in close proximity to water, infrastructure and transport. The new resource estimate is based on geological, geophysical, drilling and coal quality information available up to February 2014. It includes results from 45 diamond drill holes, completed by Berkh Uul's previous Russian owners, and Auminco. The resource model has outlined multiple shallow dipping sub-parallel coal seams on the eastern limb of a gently folded syncline, with individual seams varying from 0.6 to 4.5 metres thick over a strike length of 3km, extending to a maximum depth of 200 metres below surface (Figure 3). The coal is bituminous in rank (ASTM classification) with average in situ quality as follows: Total Moisture 19.8%, Calorific Value 5,323 kcal/kg (air dried basis, adb), Ash 15.5% (adb), and Total Sulphur 0.37% (adb). The Berkh Uul resource is reported by resource category and seam group in Table 1. The JORC Code reporting criteria and input parameters used for the resource estimate are summarised in Appendix A. "Berkh Uul provides a perfect start up project in Mongolia for the merged entity, with anticipated low capital cost, low initial operating cost and no infrastructure needs. Close to the Russian border and with rail access within 40 km, the existing Mongolian and Russian markets for our good quality, unwashed coal are readily available. We expect that the resource will be increased by further step-out drilling, which would provide the basis for a long life open cut mining operation". The Berkh Uul deposit remains open along strike to the south and down dip to the west (Figure 4). RPM has estimated an exploration target covering the area down dip beyond the current resource boundary, where future planned exploration drilling will be concentrated in the next 12 months. A further extrapolation of 1,000m from points of observation has been applied for estimating an exploration target range of zero up to 23 Mt. It is likely that the quality of the exploration target tonnages will be similar to that of the estimated resource. The potential quality and quantity of coal in this exploration target is conceptual in nature, there has been insufficient exploration to define a coal resource and it is uncertain if further exploration will result in the determination of a coal resource. In addition, step-out drilling, planned to be completed in the next 12 months, along strike to the south will target near surface extensions of the current resource, where approximately 2 strike km of the prospective coal horizons have yet to be drill tested. During the six months to 31 December 2013, Perth-based Viking Ashanti completed a number of reviews of projects and companies which were considered complimentary to the Company's strategic objectives, culminating in the November announcement of a proposed merger with unlisted Sydney-based emerging coal producer, Auminco Mines Limited. The Company also completed a resource update of the wholly owned Akoase East gold deposit in Ghana, West Africa. Auminco is a Sydney based emerging coal producer with two high quality strategically located coal projects in Mongolia (Figure 1). There is near term production potential from the Berkh Uul bituminous coal project, located near the Russian border, rail infrastructure and potential off-take customers. The Khonkhor Zag anthracitic coal project is located on a granted 30 year mining lease close to China's border with only 1.2 km of the 4 km strike explored by drilling. 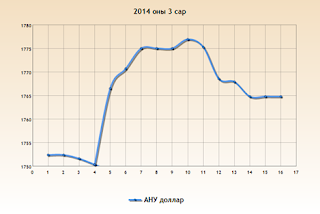 Further upside potential exists through Auminco's portfolio of additional coal and base metal projects in Mongolia. Auminco was founded by the founding shareholders and former management of Coalworks Limited (ASX: CWK) which was taken over by Whitehaven Coal Limited (ASX: WHC) for approx. $200 million in June 2012. Auminco is more than 50% owned by ex-Coalworks management and advisers. On 15 November 2013 the Company disposed of the 70% interest it held in Khangi Prospecting LLC in Mongolia. The cash consideration received for the disposal was US$53,788.85 (A$57,649). As described in the Company's annual report the carrying value of the interest in Khangi Prospecting LLC had been written off at 30 June 2013. As disclosed in Note 14 the consolidated entity disposed of its subsidiary, Khangi Prospecting LLC. The consolidated entity has been unable to access all the books and records for the period 1 July to 15 November 2013. We have not been able to obtain sufficient appropriate audit evidence to satisfy ourselves as to the completeness and existence of these amounts. Consequently, we were unable to determine whether any adjustments to these amounts were necessary to the statement of financial position as at 31 December 2013 and the statement of profit or loss and other comprehensive income, statement of cash flows and the statement of changes in equity and associated notes for the half-year ended 31 December 2013. Attention is drawn to the comparatives figures included in the consolidated statement of financial position at 30 June 2013. We have been unable to obtain sufficient appropriate audit evidence on the amounts included in the consolidated financial statement of financial position at 30 June 2013 relating to Khangi Prospecting LLC as this information could not be obtained from local record holders in Mongolia. Consequently, we have been unable to determine whether any adjustments to the amounts included in the consolidated statement of financial position at 30 June 2013 would be necessary should this information have been made available. Accordingly, we do not express a conclusion on the accuracy of any financial information included in the consolidated statement of financial position as at 30 June 2013. Our review conclusion in the current period's financial report is modified because of the possible effect of the matters outlined above on the current period's figures as we are not able to determine the effect that any adjustments would have, if any, to these amounts in the consolidated financial statements at 31 December 2013. The consolidated entity incurred an operating loss after tax of $420,821 (2012: loss after tax of $1,036,284) for the half-year ended 31 December 2013. 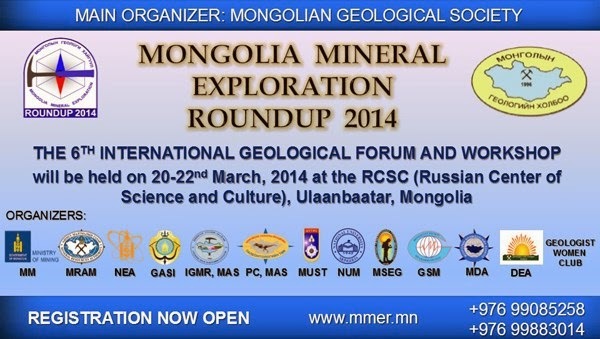 The primary activities during the period were exploration for mineral resources in Australia and in Mongolia. General Mining Corporation Ltd ("GMM") holds a number of mineral exploration titles (including joint ventures) in Western Australia and (through its wholly owned Mongolian subsidiary, Golden Cross LLC) it held mineral exploration licences in Mongolia. During the half year the Company commenced the orderly wind down and divestment of the Mongolian operations and the exploration licences have been relinquished or allowed to lapse. Mongolia enters into long and cold winter commencing from October every year. 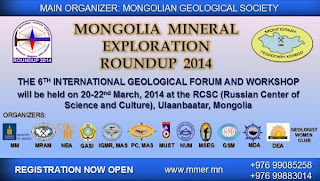 Accordingly, the exploration activities carried out by the Group in Mongolia have to suspend. The Group is preparing to apply for consent, permit and approval required to mine from the relevant government authorities in respect of its copper mine in Dundgobi Aimag. During the period under review, additional exploration works for the copper mine in Bayan-Ulgii Aimag, Mongolia, in which the Group owns a 10% interest, continued to be conducted and such work will continue after the winter. 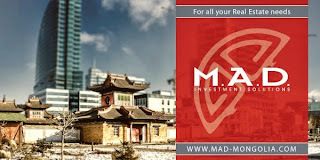 During the period under review, due to various internal and external factors, the investment traction and foreign investment in Mongolia decreased, which significantly hit Mongolia's economy and tugrik, the currency of Mongolia, significantly depreciated and inflation surged accordingly. The laws and policies of Mongolia have been changing, which often makes investors at a loss as to what to do. The Group is also cautious towards its investment in Mongolia. The Group expects Mongolia's new Foreign Investment Act and various laws and regulations which are being revised to effectively stabilize the legal environment of foreign investment in the mining industry in Mongolia. Ulaanbaatar, March 14 /MONTSAME/ At the Stock Exchange trades held Friday, a total of 54 thousand and 967 shares of 27 JSCs were traded costing MNT 24 million 834 thousand and 638.27. "Remikon" /26 thousand and 725 units/, "Hai Bi Oil" /19 thousand and 240 units/, "Genco tour bureau" /3,755 units/, "Khokh gan" /2,000 units/ and "Gobi" /1,405 units/ were the most actively traded in terms of trading volume, in terms of trading value--"Gobi" (MNT nine million 484 thousand and 230), "Hai Bi Oil" (MNT six million 717 thousand and 800), "Remikon" (MNT four million 089 thousand and 549), "APU" (MNT 830 thousand) and "Eermel" (MNT 794 thousand and 955). The total market capitalization was set at MNT one trillion 675 billion 339 million 517 thousand and 139. The Index of Top-20 JSCs was 16,727.73, increasing by MNT 68.25 or 0.41% against the previous day. March 14 (Cover Mongolia) As of March 14, ₮487.5 billion (₮487.5 billion as of March 10) existing mortgages of 17,239 citizens (17,238 as of March 10) were refinanced at 8% out of ₮844.9 billion (₮844.9 billion as of March 10) worth requests. Also, ₮910.2 billion (₮903.7 billion as of March 10) new mortgages of 16,131 citizens (16,006 citizens as of March 10) were issued at new rates out of ₮948.1 billion (₮927.7 billion as of March 10) worth requests. March 15 (Bloomberg News) Mongolia's foreign currency reserves, down 40 percent in the last year, are on pace to run out by the end of 2014 unless the country can sell more debt, according to Moody's Investors Service. Should reserves expire Mongolia "would issue another bond and that would buffer reserves for an extent," Anushka Shah, Moody's lead analyst on the Central Asian nation, said by phone yesterday. Currency reserves have dwindled amid falling prices for copper and coal, Mongolia's main exports. Foreign investment has also fared poorly, falling by half last year during a protracted dispute with Rio Tinto Plc (RIO), which operates the Oyu Tolgoi copper and gold mine, Mongolia's biggest mining project. 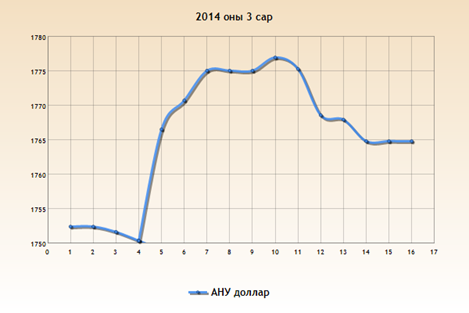 Foreign currency reserves at the end of January were $2.44 billion, according to the Bank of Mongolia website. Mongolia has raised about $2.3 billion in sovereign debt since March 2012, including a $600 million bond issued by the Development Bank of Mongolia, a 30 billion yen ($296 million) Samurai bond and a $1.5 billion Chinggis bond. Moody's, which has a B1 rating on Mongolia with a stable outlook, sees the country's expansionary economy as a risk. "If you look at monetary policy it has been very expansionary over the past year," said Shah. "The central bank has been running a number of programs that have injected a large amount of liquidity into the system." Programs to stabilize prices, finance mortgages and boost construction injected 3.4 trillion tugrik ($1.9 billion) into the economy over the past year, according to Moody's. However, issuing debt to tide over the deceleration in FDI and exports is not sustainable in the long term, said Shah. "It would be more favorable from a credit perspective if they can shore up FDI with improved export growth, which should happen once Oyu Tolgoi comes onstream," said Shah, referring to the halted work on the mine's underground expansion. "But in the meantime it seems like they will tide things over by raising more debt." Any bond sale is expected to be dollar denominated, said Shah. That would happen amid a declining tugrik, which has seen a year-on-year depreciation of 26 percent against the dollar. March 14 (infomongolia.com) Upon the initiation of the Vice Minister of Foreign Affairs of the People's Republic of China Liu Zhenmin, Minister of the Cabinet Office of the Government of Mongolia Ch.Saikhanbileg has conducted a working visit to Beijing and held bilateral talks with the Vice Minister on March 13, 2014. During the visit, Mongolia-China consultative meeting was organized, where representing the Government of Mongolia, Ambassador Extraordinary and Plenipotentiary of Mongolia to the PR of China Ts.Sukhbaatar, Chairman of Customs General Administration O.Ganbat, Chairman of General Agency for Specialized Inspection D.Batmunkh and Director-General of Immigration Agency B.Purevdorj were present and the other by Vice Minister Liu Zhenmin and Inner Mongolia Administrative authorities. After the ratification of Border Port Law, the Ports General Administration is being established under the Cabinet Office of Mongolia and Minister Ch.Saikhanbileg will chair the Ports National Council. In the scope of setting up such organ, Mongolian authorities deem it would enable to cooperate with affiliated neighboring offices at same level. Following the meeting, parties agreed the border relations between the two sides have opened a new page and within the consultative meeting, it was negotiated to enhance the ports' construction and management, to establish new standards and improve the border region economy by creating new opportunities for cooperation, also to renew the border agreement between China and Mongolia signed in 2004.
by Brian White, March 16 (The Mongolist) Speaker of Parliament Z. Enkhbold recently tweeted an observation (see original tweet below) that seemed like an attempt to put the continuing depreciation of the Tugrik against the US Dollar in perspective. He posted a link to a Wall Street Journal article (here) about the Chinese Yuan experiencing a 0.9 percent decline in value against the Dollar since the beginning of the year. He then noted that "the Tugrik is not alone in its fall." The subtext of the tweet seemed to be that recent, sustained declines in the value of the Tugrik have been due to outside economic forces, which are also affecting the Chinese currency, rather than the result of domestic politics or economic policy over the last 12-18 months. But, there is a significant problem with his observation: magnitude. Since January 2013 the Tugrik has depreciated by almost 25 percent. 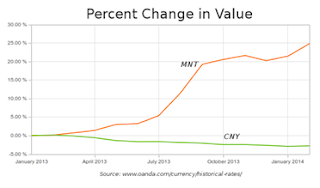 The Yuan has appreciated over that same period approximately 2.75 percent (see graph below). Although the Yuan has experienced a 0.9 percent depreciation from its peak value since the start of 2014, the Tugrik has depreciated approximately 6.5 percent during the same period. These are such significantly different rates of change as to not even be comparable economic trends. To illustrate what I mean, let's assume hypothetically both rates of depreciation continue to trend at the same pace until March 15, 2015. The Yuan will lose about 4.3 percent of its value against the Dollar. In contrast, the Tugrik will lose approximately 31.2 percent of its value, which means reaching an exchange rate of about 2,330MNT to 1USD! A year ago it was trading at 1,393MNT to 1USD. 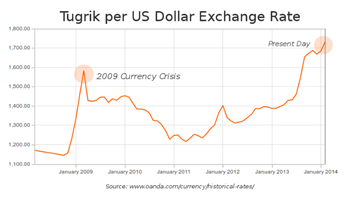 The Tugrik to Dollar exchange rate is following a steep trend that started approximately 12 months ago (see graph below). This trend began well before the Yuan's recent fluctuations, and it began primarily as the result of domestic politics and economic policy negatively impacting coal exports and Foreign Direct Investment (FDI). The Tugrik depreciation has also been significantly steeper and sustained over a longer period of time, whereas the Yuan seems to have already levelled off and may even begin to appreciate again. Although it may be politically appealing to spin the Tugrik's depreciation as part of a wider market trend, the reality is that the Tugrik is following its own unique path that began many months ago at a very different level of magnitude from the Yuan. March 16 (Frontier LLC) Frontier has revised the model portfolio based on our observations on current economic conditions in Mongolia. · Food sector is vulnerable to the movement of the exchange rate. And, it is not easy to shift the cost increase to consumers. So, we have decreased the weighting of APU. · Domestic Bonds are totally eliminated from the portfolio because of the low coupon and still strong selling pressure to MNT. Cash (MNT) has been reduced by half because of the weakness of the currency. But, still 10% is allocated because of the higher interest rate. · Cash (USD) has been increased to 10% given the opportunities to invest in foreign listed Mongolian securities in a near future. March 13 (Oxford Business Group) New measures announced by the Mongolian government aimed at lowering the tax burden for small and medium-sized enterprises (SMEs) should serve as an incentive for private sector operators to expand, but businesses may still face challenges in obtaining the credit they need to sustain growth. In mid-January, the government announced it would submit a plan to parliament to amend tax regulations regarding the payment of value-added tax (VAT) by SMEs. Under the proposal, companies with revenues of less than $29,000 would be exempt from VAT. At present, the exemption ceiling for VAT payments is set at $5800, a level put in place when the existing tax law was enacted 15 years ago and left unchanged since. According to estimates, around half of Mongolia's more than 60,000 SMEs will be excused from submitting VAT returns once the amended legislation comes into effect. Though likely to benefit most SMEs, the proposed amendment is not as extensive as one put forward by some parliamentary deputies last year, which called for raising the minimum income level to $116,000. The draft legislation also contains an amendment that would establish a 90% rebate on income taxes for businesses with revenues of less than $875,000, another measure that would help SMEs. This amendment, unlike that on VAT, excludes companies operating in certain sectors, including minerals, petroleum products imports, oil exports and communications, as well as the production and distribution of alcoholic beverages and cigarettes. Mongolia's SMEs represent a large and growing segment of the economy. According to data provided by the Ministry of Labour at the end of November, of the just over 90,000 businesses registered in Mongolia, more than two thirds are classified as SMEs. Small companies generate around 20% of Mongolia's GDP and provide employment to almost 750,000 people, representing 70% of the national workforce. As is the case in many emerging markets, one of the barriers to growth for smaller businesses in Mongolia is access to credit. In an opinion piece published in the local media, Paul Sullivan, professor of economics at the US National Defence University, wrote, "It is very hard, especially for the micro enterprises, to get credit to expand their businesses or to carry them through the production to trade cycles." International agencies and the government have already taken some steps to address this issue, and SME funding to Mongolia has increased in the past several years. The World Bank, the German Development Bank and the Japan International Cooperation Agency have established a series of pass-through loan programmes that have provided long-term, low-interest funds to banks, which in turn can make loans to SMEs. The government has also set up an SME fund that provides loans to banks at below-market rates, which can then be used to extend credit to local businesses. However, in an interview with OBG, Randolph Koppa, the president of the Trade & Development Bank, said more could be done. "The biggest challenge is the need for more long-term, low-cost funding, either from the government or international sources. Extending these programmes will help banks expand their portfolios of SME loans." There are other areas in which the growth of SMEs can be supported, Peter Markey, a partner at Ernst & Young, told OBG. "SMEs can be incentivised through government subsidies, direct grants, less bureaucracy, and more importantly, through a good education system. Education should encourage people to be entrepreneurial and take business risks while developing at the same time the necessary technical and business oriented skills," he said. Combined with tax breaks and better financing, efforts to build human capital could help diversify Mongolia's economic base beyond the mining sector and ensure more inclusive growth. Ulaanbaatar, March 14 (MONTSAME) The Czech Republic has expressed its willingness to cooperate with Mongolia in the energy sphere. A senator of the Czech Republic Mr Jaroslav Doubrava said it during a meeting with D.Delgertsogt, the State Secretary of the Mongolian Ministry of Energy. His delegation has comprised Milan Klecka, the president of the Czech Chamber of Commerce for East Asia. "Czech companies have big experiences in creating electricity sources from solar, wind and water. We can invest a project on erecting a hydroelectric power station on the Eg river," Mr Doubrava said. March 14 (business-mongolia.com) State Property Committee made a statement yesterday that the feasibility study for developing an Gurvanbulag uranium deposit located in Dornod Province. After the completion of the feasibility study the commencement of the development will be decided. A state owned Mon-Atom LLC which has the special right from the government to explore and operate uranium deposits in the country is responsible for the whole process. The company also emphasized that the proven reserve is 63 thousand tons and has a potential to be increased. March 16 (UB Post) In the fashion world, Mongolian designer, Ariunaa Suri is an emerging talent. She studied at the University of Arts in Bremen, Germany and graduated as a fashion designer. In 2013, she showcased her collection along with the world's top 50 designers at the Mercedes Benz Tokyo Fashion Week. During the summer, she came back to Mongolia and launched the SS 2014 International Festival. This success has encouraged her to participate in the 2014 Tokyo Mercedes Benz Fashion Week. Ariunaa Suri spoke to journalist of Mongol News Group, owner of The UB Post, about her collections for this year's Tokyo Fashion Week. 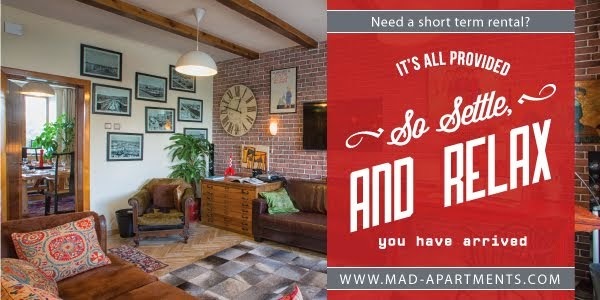 -To introduce your collection in the fashion world, a catchy and unique name is important. Is this why you named your brand "Ariunaa Suri?" -That's right. My father's name is Ts.Surenjav. I needed a unique name to introduce my collection to the fashion world so I combined the first part of my father's name with my name. This name has defined me since my student days. I felt as though this name could define me when I opened my own brand. Later, I found that the name I accidentally gave had a special meaning. Apparently, Suri is the name of a flower. -The Mercedes Benz Tokyo Fashion Week is about to take place. You seem to be busy choosing your models and completing the designs? -Last Saturday, I chose all the models that will accompany me to Japan. I chose female models taller than 175 cm, they can't be short just because they're Mongolians. I don't like empty eyes or gazes. Many things can be expressed through the eyes including their aspirations, dreams, passion, happiness and loneliness. Therefore, the qualifications were to have unique features with intellectual and passionate gaze. Since I got some experience from last year's event, I'm planning to make an impact this year. -For you who spent many years in Germany, what drew you to Japan? -The University of Arts in Bremen of Germany is famous worldwide. When I was in Germany, I worked as assistant fashion designer for the brand Zero. I was a determined student who actively participated in design competitions organized by the school. I learned many things from Germans. This influenced my success. Although the Japanese and Germans differ in lifestyles and physical features, the way they treat work, their efficiency, organized and hardworking attitudes are the same. From my observations, Japanese people don't get easily acquainted with people just like Germans. The people of Japan were able to implement advanced technologies in their daily lives. They are fashion experts and also have unique styles. They're skilled at finding diversities in things. -From German characteristics and behavior, what did you learn? -Germans hardly rely on others. They'll never become friends with you after meeting for a day. They will consider you a friend only when they know your personality. It takes quite a bit of time to become friends with them. Once they know you, they're very loyal. I like their trustful personality. Whoever it may be, I welcome them as if they're my old acquaintances. A lot of people I've met tell me that it feels as we had met before. Though my classmates didn't have any knowledge about Mongolian cultures and customs, I wanted to get to know them. When I had time, I would make buuz and give them to my classmates. They really got into the taste of Mongolian cuisines and would ask for more. -I see that you have focused heavily on sewing and tailoring patterns? -When I was a student, in order to become familiar with Asian history of clothes, I studied sewing and tailoring of Japan, Korea, Indonesia and Thailand. Asian clothing tailoring share common features. In other words, the tailoring of both men's and women's clothing is the same. For instance, for Mongolians, it's deel. It suits both men and women so it can be worn by both. As for European clothes, it's different. The perception that men have to wear trousers and women have to wear dresses still remains in the mentality. Asian tailoring can help break this mentality. I chose this as my key concept to work with. From studying the history of Mongolian traditional clothing, I found that clothing changed depending on the environment and society. Most recently, I researched deels of Khunnu era from old discoveries. My designs will portray fine features of tailoring and patterns of Mongolian clothing. I like showing reflections and patterns in my designs. I also try to follow unique patterns. I believe that the secret to attracting attention lies in sewing and tailoring. -As for colors, you prefer to generally use soft, warm and natural colors? -I don't put restrictions on colors. I like transitional colors since they contain properties of nature. When designing, I mainly choose grey, green or blue. -Why did you name your designs "Echo of Water," "Echo of Light," "Echo of Sand" and "Echo of Land?" -I get ideas and determine colors for designs from natural occurrences. Human beings are inseparable from nature. Therefore, we need to live with reverence and appreciation of nature. My objective is to show through my designs, to love mother nature, save water and treat nature properly. Artist need to give correct and necessary understandings through their work. During New Year, many women asked me to make them gowns. Since I couldn't make gowns for everyone, I decided to do an auction. One day, I went to meet some of my close friends whom I'm able to express my thoughts freely. Then the former director of Mongolian State Academic Theater of Opera and Ballet proposed the idea of naming my collections as "echos." I liked this idea so I named my collections "echo." Adjusting to the gowns' designs and tailoring features, I named them "Echo of Water," "Echo of Light" and "Echo of Sand." For instance, when designing the "Echo of Light," I was portraying the period of ambiguity before dawn. -You've said that you like making clothes with flax grass materials. What's special about this fabric? -Flax grass fabrics are able to keep their natural characteristics. It's the most suitable fabric to make clothes with since they don't lose their color or shape when washing or cleaning. When wearing, it's smooth and maintains your body temperature. -Is it true that MIAT Mongolian Airlines is having their new uniforms made by you? -MIAT is renewing uniforms of its stewardesses. Clothes of major entities that become the face of the country are usually designed by the countries' foremost designers. I'm very grateful that they entrusted me with this task. -What's the main feature of the collection you've prepared for the Tokyo Fashion Week? -With my next year's autumn and winter collections, I will show that you can design clothes with unique patterns. To make my collection more interesting, I put efforts to bring out spiritual features. In religions, this is used to attract attention by mesmerizing. In the background, songs of The Lemons band will be played. I did some research to make the designs and patterns of my clothes new and unique, and got many experimental materials and fabrics. Should I say that I broke a common mentality of clothes? Its special feature is that I combined experience from Europe with Mongolian culture. We must make clothes that can be recognized by the world. I want a piece that will make world designers exclaim and praise Mongolian brands when they see it. -Considering that you like putting mainly natural colors and elements in your designs, were you perhaps raised in the country side? -Chandmani soum in Khovd Province is my grandparent's birthplace. I was raised by my grandparents when I was little. Even though it's little, I'm proud to have learned from their knowledge of life. My grandfather used to remind me not to pollute springs and streams, pull grass or flowers, or replace mountain stones from their place. Since I was a child, they taught me to love nature. During summer, they used to pasture in mountainsides. I would always hurry to the countryside during holidays. The fact that I like fusing natural colors and elements in my designs might be due to the fact that I was raised in the countryside. When I'm successful, I imagine myself going uphill on those mountains and when I'm frustrated, I imagine myself sitting at the bottom of a mountain. -It was said that your grandfather was a craftsman and he used to paint. Did you inherit his talents? -I inherited my grandfather's drawing skills. He used to forge and craft earrings, rings, saddle, bridle, beds with patterns and treasury boxes for the local people. He liked to see and observe things. He would take me to the mountains for herborization and taught me about the use of herbs. Later, we would make medicines with it. He told me to carefully observe wild horses and draw them. When I became a student, I took my camera to take pictures of nature. I learned peace and comfort from the quiet countryside. I try to be as close to nature as possible by observing sunrise and sunset. In 2005, the photos I took were published in Unuudur newspaper by the name "Setgelin Taiz"(Stage of Emotion). My mother used to be a photographer. My mother's hobby also influenced me. In my case, I mainly concentrated on the fashion world but photography is my hobby. March 16 (UB Post) The history of the bicycle began in the 19th century, but Mongolians became acquainted with the bicycle about 100 years ago. Nowadays, the bicycle has become daily transportation for people in many countries where bicycles outnumber cars. In the Netherlands there are over 16 million people, seven million cars, and 20 million bicycles. Most of the Dutch prefer to ride bicycles, while Mongolians choose cars and dislike cyclists who ride their bicycles on the road near passing cars. To change this view of Mongolians, in 2011, Today Newspaper organized the first "Today with Bicycle", and initiated a project to build a bicycle road. The Mongolian Youth Federation, Young Cyclist Club, New Image Club of the General Planning Department of Mongolia and nine other organizations together revitalized the project "Ulaanbaatar with Bicycle" in October 2013, setting a purpose to encourage Ulaanbaatar citizens to choose bicycles. However, this project hasn't been fully implemented. It's praiseworthy that they are promoting bicycles, which do not produce emissions, are environmentally friendly, and healthy. A new bicycle road this year? As planned, this project must be implemented within three years to build a 143.7 kilometer bicycle road and 99 bicycle parking spaces. This will contribute to reducing Ulaanbaatar's pollution, decreasing traffic congestion, supporting people's health, and developing cycling in Mongolia. The project team planned to introduce the project to people and then conduct a survey; if over 20 thousand people were in support of this project they would continue the work, if not, they would abandon it. When the project team conducted a survey from October 5 – 20, 2013, over 25 thousand people supported their project. They presented the project to a Citizens' Representatives meeting in Ulaanbaatar in December 2013, and it will be financed by one billion MNT. Thus, it's possible to build the bicycle road this year. Where to build the road? The area is important to building a bicycle road. Does Ulaanbaatar have free area to build a bicycle road, when there are so few sidewalks? Architect of the General Planning Department and head of New Image Club, D.Khan-Uul made a plan to first build a 58 kilometer bicycle road compatible with the General Development Plan of Ulaanbaatar. This 58 kilometer road would be included in a new road being built west of Bogd Khan Mountain, on the flood protection dam near Dund River, and would follow the road from Peace Bridge (Enkhtaivan's Bridge) to Sun Bridge (Narnii Bridge) and other possible areas. According to this project, every district is included in the blueprints for the bicycle road. Last week, Young Cyclist Club members lost five of their bicycles. They say that it happened as a result of the city's lack of secure bicycle parking. Most other countries allow financing for bicycle parking from the state budget. Whereas, the Ulaanbaatar with Bicycle project team is researching the possibilities of building bicycle parking with the help of organizations. But this will be actualized after building the road. They also plan to select the best "Organization with Bicycle" and present them with an award. According to the Ulaanbaatar with Bicycle plan, parking and bicycle rentals will be established at seven locations; places like Chinggis Square, East Cross Road, 120 Myangat District, Sapporo, and West Cross Road. A person who rents a bicycle would be able to return it to any bicycle rental station near their destination. There would be no need for a deposit to rent bicycles; just a digital copy of a passport would be enough. It would cost 1,000 MNT to rent a bicycle for 30 minutes and the high quality bicycles would meet international standards and be well maintained. Secretary of the Mongolian Cycling Federation Z.Naran, who initiated and organized this project said, "We planned to establish bicycle parking for 50 bicycles. It could be increased if people will support this work. There weren't any bicycle roads in Paris until the rental posts appeared in 2000. The Government of France started building bicycle roads when people supported the rental posts. There is a calculation that 72 million people out of 82 million in Germany have a bicycle. Stories like these show that people of other countries understand the benefits of bicycles and have made them their main device of transport. Mongolians think the bicycle makes the legs crooked. But it's not like that; it gives your body health." The project team has implemented the following work already: to define safe areas to build a bicycle road, and to reflect these bicycle roads in the blueprints for planned roads in Ulaanbaatar. Project organizers are almost ready to build parking and rental stations. All cooperating organizations participated in a forum on February 28. At the forum they decided to draft a project to make an amendment to traffic law and other related laws, to make the legal environment better for cyclists. The organizations that participated in the forum decided to establish a joint team of researchers and to involve authorities from the Governor's Office, ministries and districts. The price of bicycles is a minimum of 500,000 MNT at department stores and 300,000 MNT at Narantuul International Trade Center. The project team believes that the price of bicycles will come down if customs tax is eliminated. The environmentally friendly and healthy qualities of bicycles are the main argument for freeing bicycles from taxes. The team started drafting a project on this change. They are also conducting research to establish a bicycle factory in Mongolia. March 16 (UB Post) Erchim Corporation commenced a trial on utilizing solar batteries for heating at ger area households in Ulaanbaatar and Bayan-Undur soum, more commonly known as Erdenet City, in Orkhon Province with assistance from Norwegian researcher, Carlsen on February 24. The researchers have installed a heater that runs on solar battery at four households. The results of the study proved that the heater is 33 percent more efficient than a conventional coal heater. The energy produced by the solar heater has 21 percent fluctuation depending on the amount of sunlight directed at the panels. Researchers reported that the heater even produced 50 degree Celsius on a clear, sunny day. The study aims to provide alternative and renewable energy solutions to the city's air pollution issues which are largely caused by raw coal burning in ger districts for heating and cooking. Norway requires 65 KW per hour to heat one square meter space, while Mongolia spends three times more energy, reported professor of the National University of Mongolia B.Amarbayar. Norwegian scientist Carlsen reported to Vice Minister of Energy D.Dorjpurev that the solar battery-powered heater is most effective when building are fully insulated. He highlighted this necessity as Mongolian ger usually lose heat through its upper parts and floor, while heat escapes from houses through mostly floors and windows due to poor insulation. Erchim Corporation's vice director B.Amarsanaa and D.Dorjpurev said the final results of the trial will be announced to the public. Vice Minister D.Dorjpurev, Chief of Strategy and Policy Planning Authority of Ministry of Energy P.Tovuudorj and the ministry's Chief of Renewable Energy Division M.Angarag visited one of the households in 12th khoroo, Sukhbaatar District. The officials said that they maintain high hopes for the experiment. Government seeks to ease pollution from burning of coal and wood in Ulaanbaatar by subsidising clean stoves. March 15 (Al Jazeera) Mongolia's government is attempting to cut down on pollution caused by the burning of coal and wood by subsidising clean stoves. The country is known as the "Land of Eternal Blue Sky", but its capital, Ulaanbaatar, is one of the most polluted, with 60-70 percent of that pollution coming from the burning of coal and wood. Al Jazeera's Marga Ortigas reports from the city. March 16 (The Japan Times) The parents of Megumi Yokota, who was abducted by North Korean agents in 1977 at the age of 13, met their granddaughter for the first time earlier this month in Mongolia, the Foreign Ministry said Sunday. According to the ministry, Yokota's father, Shigeru Yokota, 81, and mother, Sakie, 78, met 26-year-old Kim Eun Gyong last Monday through Friday in Ulan Bator. Kim was born in North Korea to Megumi Yokota and Kim Young Nam, a South Korean also abducted by Pyongyang. Kim Young Nam was not present at the meeting, according to the ministry, but the husband of Kim Eun Gyong and their daughter apparently took part. "It was a miraculous event and it provided great pleasure," the Yokotas said in a statement Sunday evening. "We strongly hope that the meeting will pave the way for rescuing all the abductees." The pair will hold a news conference Monday. Yokota, who North Korea claims killed herself in 1994, became a symbol of a bitter bilateral feud over Pyongyang's abduction of Japanese nationals in the 1970s and 1980s, mainly aimed at training North Korean spies in Japanese language and customs. Tokyo rejects as baseless the claim that Yokota committed suicide. Japan and North Korea agreed on the encounter at informal talks between their officials in the Chinese city of Shenyang earlier this month, on the sidelines of a gathering of the two countries' Red Cross societies, the ministry said. Sakie Yokota met Sunday morning with the head of a group supporting the families of Japanese abductees and said she remains confident that her daughter is alive, according to a statement issued by the group. "We are only thinking about rescuing all the abductees, and we went (to Mongolia) to that end," she was quoted as telling Tsutomu Nishioka, chairman of the National Association for the Rescue of Japanese Kidnapped by North Korea. "Our confidence about Megumi's survival has not been shaken at all," she was quoted as saying. Some information about their daughter may have been provided, but it remains uncertain whether the latest developments will lead to any breakthrough on the abductees. The issue has prevented Tokyo and Pyongyang from normalizing relations. Yokota's parents had long hoped to meet their granddaughter, who lives in North Korea and is also known as Kim Hye Gyong. But some experts believe Pyongyang may seek to exploit the meeting as a step toward trying to finally bring the abductees issue to a close, which Japan has no intention of allowing. Shigeo Iizuka, representative of the Association of the Families of Victims Kidnapped by North Korea, told reporters he believes the Yokotas had a growing desire to meet their granddaughter amid the stalemate on the abduction issue, given Shigeru Yokota's advanced age. "I have not heard anything (about the meeting) from the Yokotas or the government . . . and I want to hear the details of the meeting and how it took place," Iizuka said. Teruaki Masumoto, secretary general of the group, said, "The abductees' group had decided not to seek a meeting (between the Yokotas and their granddaughter) in North Korea, but it had not ruled out such a meeting in a third country. "It was good that the meeting took place in Mongolia . . . but we have to take seriously the fact that Megumi was not there." Tokyo continues to demand that Pyongyang reinvestigate the abduction cases. The Japanese and North Korean Red Cross societies are scheduled to meet again in Shenyang for two days from Wednesday, with the participation of government officials from the two nations. Japan is expected to again send Keiichi Ono, director of the Foreign Ministry's Northeast Asia Division, to hold another round of informal talks with his North Korean counterpart. The Foreign Ministry embraced the meeting between the Yokotas and their granddaughter as a positive development, and plans to seek the reopening of intergovernmental talks, ministry officials said. Formal talks between Tokyo and Pyongyang have been suspended since North Korea's December 2012 launch of what it claimed was a satellite and other countries condemned as a covert ballistic missile test, in violation of U.N. Security Council resolutions. North Korea admitted in 2002 to having abducted or lured a number of Japanese nationals in the 1970s and 1980s, including Yokota as she was walking home from school in Niigata Prefecture. In 2004, Pyongyang repatriated cremated remains it alleged were Yokota's. However, DNA tests conducted in Japan subsequently disproved that assertion. SEOUL, March 14 (Yonhap) -- South Korean President Park Geun-hye sought Mongolia's support for her vision to bind Asia and Europe closer together as she met with the country's parliamentary speaker on Friday. Park's "Eurasian initiative" was a key topic during her talks with parliamentary speaker Zandaakhuu Enkhbold. He has been on a four-day visit to South Korea since Tuesday at the invitation of his South Korean counterpart and National Assembly Speaker Kang Chang-hee. The initiative calls for binding Eurasian nations closely together by linking roads and railways to realize what she called the "Silk Road Express" that runs from South Korea to Europe via North Korea, Russia and China. Park said Mongolia is a key partner for the vision and asked for support, officials said. Enkhbold said he supports the vision "200 percent." The speaker said that Mongolian President Tsakhiagiin Elbegdorj asked him to convey his regards to Park and wished her good health and happiness. Park also asked the parliamentary speaker to convey her regards to the Mongolian president. Park said that it was meaningful that Elbegdorj urged North Korea to become a responsible member of the international community when he visited Pyongyang in October. The four-day trip made Elbegdorj the first foreign head of state to visit Pyongyang since North Korean leader Kim Jong-un took power after the death of his father Kim Jong-il in late 2011. At the end of the trip, the Mongolian leader delivered a lecture at Kim Il Sung University. In the speech, he urged Pyongyang to let its people "live free" and emulate Mongolia's model of transformation, saying, "No tyranny lasts forever." Enkhbold said Mongolia is ready to share its reform experiences with North Korea. Park also called for Mongolia's support for unification between the two Koreas, saying it will not only contribute to peace and stability on the Korean Peninsula and in Northeast Asia, but will also provide a fresh growth engine for countries in the region. She also asked for support for South Korean firms trying to take part in infrastructure construction projects in Mongolia, officials said. Ulaanbaatar, March 14 (MONTSAME) The Ministry of Road and Transportation A.Gansukh paid a working visit to South Korea on March 10-11. The Minister met with the Ministers of the Foreign Affairs and of Land, Infrastructure and Transport to focus on cooperation between the two countries. He said the infrastructure and roads are considered as main factors in Mongolian economic growth and prosperity, and underlined that our country needs to intensify cooperation with S.Korea. At a meeting with his counterpart Mr Suh Seoung-hwan, Mr Gansukh mentioned about projects running in our infrastructure sector, such as connecting all aimags by asphalt roads to the UB city, transporting domestic mining products to foreign market, running railway and building modern airport. He also noted that the S.Korean latest hi tech and management will execute main role in a successful realization of the above projects. The sides agreed that these projects will be introduced to the S.Korean part next month. KUWAIT, March 16 (KUNA) -- Minister of Amiri Diwan Affairs Sheikh Nasser Sabah Al-Ahmad Al-Sabah received on Sunday Ambassador Extraordinary and Plenipotentiary of Mongolia to Kuwait Sodnom Enkhbat. The two sides discussed issues of common concern for the two friendly countries. March 14 (infomongolia.com) On March 13, 2014, the President of Mongolia Ts.Elbegdorj received the Director-General of Food and Agriculture Organization of the United Nations Jose Graziano da Silva. At the beginning of meeting, President Ts.Elbegdorj said, "This is your second visit to Mongolia since your appointment as the FAO Director-General that shows us your commitment and special concern to our bilateral cooperation". Director-General Jose Graziano da Silva appreciated the President for accepting his invitation to meet and expressed his commitment to further promoting mutual cooperation with Mongolia. Mr. Jose Graziano da Silva said, "The 31st session of the FAO Regional Conference for Asia and the Pacific was successfully held in Hanoi, the Socialist Republic of Vietnam in March 2012, and the 32nd Session of the Conference is being conducted in Ulaanbaatar, Mongolia". President Ts.Elbegdorj added, "On behalf of the people and the herders of Mongolia, I would like to express our sincere appreciation to the FAO for its timely and efficient assistance for improving agricultural productivity, more specially for emergency assistance during Zud disaster (or "dzud", severe weather conditions). Mr. Graziano da Silva appreciated Mongolia for its support and cooperation with the FAO. He also said that he was impressed by the Mongolian pristine nature and uncontaminated soil. In response, President Ts.Elbegdorj said, "Mongolia would like to deepen our partnership with the FAO in order to make tangible contribution to the regional food security by efficiently using our renewable resource of livestock and fertile vast land for organic products including crop and sea-buckthorn. I hope that Mongolia and the FAO relations will be entering in new level with the expectation for the FAO will be extending timely and demand based technical assistance to its member states within the frame of the FAO reform for decentralization under your leadership". March 14 (infomongolia.com) On March 13, 2014, six foreign Ambassadors Extraordinary and Plenipotentiary to represent their nations to Mongolia have presented their Letters of Credence to the President of Mongolia Ts.Elbegdorj in the Government House, Ulaanbaatar. These envoys are Ambassador of the Republic of the Sudan to Mongolia Mr. Omer Eisa Ahmed, Ambassador of the Republic of Finland to Mongolia Mr. Jari Gustafsson, Ambassador of the Kingdom of Belgium to Mongolia Mr. Michel Malherbe, Ambassador of the Republic of Angola to Mongolia Mr. Joao Garcie Bires, Ambassador of the Republic of Ireland to Mongolia Mr. John Paul Kavanagh and Ambassador of the Oriental Republic of Uruguay to Mongolia Mrs. Maria del Rosario Portell and all are non-resident Ambassadors to Mongolia. After the ceremony President Ts.Elbegdorj held a brief meeting with each Ambassador and wished success in their further endeavors. The meetings were held in a friendly and warm atmosphere, where Head the Office of the President P.Tsagaan and Foreign Minister L.Bold were present. During his meeting with Ambassador Omer Eisa Ahmed, President Ts.Elbegdorj expressed his confidence that the bilateral relations between Mongolia and the Republic of the Sudan will further deepen and noted that the fourth shift of Mongolian peacekeepers are serving in the United Nations Mission in Darfur (UNAMID) as of the end of 2013. The 70-90 percent of Sudan's export accounts for oil. Ambassador of Finland, Jari Gustafsson expressed that he would make every effort to enhance the traditional relations between the two countries and President Ts.Elbegdorj mentioned Mongolia and Finland marked the 50th Anniversary of diplomatic relations last year. In the scope of the anniversary a book "100 Social Innovations from Finland" was translated into Mongolian language. Finland is cooperating with Mongolia on judicial reform and we are aiming to promote mutual partnership in education, culture and science sector. During his meeting with Ambassador of the Kingdom of Belgium Michel Malherbe, President Ts.Elbegdorj thanked for presenting credentials and parties exchanged views on cooperation in promoting democratic values, preserving international peace and stability and deepening economic, trade and investment cooperation. President Ts.Elbegdorj expressed his hope that Ambassador of Angola Joao Garcie Bires will make great contribution to expanding traditional friendly relations that lasted over 40 years between the two countries. Angola is rich in oil, diamond, coffee, cotton, gold and crude sugar. Therefore, both countries have ample opportunities to cooperate in agricultural sector. Ambassador of Ireland John Paul Kavanagh expressed that he would make best efforts to strengthen bilateral people-to-people relations between Mongolia and Ireland. Also, Ambassador raised issues on enhancing education, science and technology cooperation. During the meeting, Ambassador of Uruguay Maria del Rosario Portell said, "I'm glad that I was appointed as an Ambassador to this beautiful country. It is our duty to expand and enhance bilateral relations. We hope that our relations would move forward and advance in positive directions. Please accept the greetings and best wishes of the President of Uruguay Jose Mujica. As you know he is an agriculture specialist. The representatives of Mongolian State Great Khural (Parliament) are scheduled to visit Uruguay next week and I am glad this visit is coinciding with my accreditation to Mongolia". In response, President Ts.Elbegdorj noted, "We hope that you would make great contribution to expanding relations of the both countries and the Office of the President and Ministry of Foreign Affairs of Mongolia would support your mission of close cooperation". March 14 (infomongolia.com) On the same day afternoon, March 13, 2014, President Ts.Elbegdorj accredited nonresident Ambassadors Extraordinary and Plenipotentiary from seven countries to Mongolia by accepting Letters of Credence with official reception ceremony in the Government House, Ulaanbaatar. The Letter of Credence were presented by Ambassador of the Portuguese Republic to Mongolia Mr. Jorge Torres-Pereira, Ambassador of the Republic of Armenia to Mongolia Mr. Armen Sargsyan, Ambassador of Bosnia and Herzegovina Mr. Borislav Maric, Ambassador of the Republic of Indonesia to Mongolia Mr. Sugeng Rahardjo, Ambassador of the Swiss Confederation to Mongolia Mr. Jean-Jacques de Dardel, Ambassador of the Republic of Suriname to Mongolia Mr. Lloyd Lucien Pinas, and Ambassador of Turkmenistan to Mongolia Mrs. Chinar Rustamova. During the meeting with Ambassador of Portugal Jorge Torres-Pereira, President Ts.Elbegdorj congratulated newly appointed envoy to represent his nation and expressed confidence to bolster bilateral ties. Mongolia and the Portuguese Republic have established the diplomatic relations in 1974. In 2010, Portuguese Foreign Minister had conducted an official visit to Mongolia, which is considered the first large-scale visit and during the visit, several intergovernmental documents were signed to enhance partnership in education, science, technology, culture, sports and press. Ambassador of Armenia to Mongolia Mr. Armen Sargsyan noted, "The friendly relations between the two countries have been marked as traditional ties since early times. However, the bilateral relations were weakening in last 20 years, but now it is time to strengthen. The Armenian Conservatory had been a source of Mongolian culture and arts, and the cultural cooperation would be impetus to restore the mutual collaboration". President Ts.Elbegdorj wished success in his further responsible mission to Ambassador of Bosnia and Herzegovina Borislav Maric, who mentioned the joint declaration to establish diplomatic relations were signed in 1993 and pledged to activate the bilateral partnership. During the meeting, Ambassador of Indonesia to Mongolia Mr. Sugeng Rahardjo conveyed greetings of the state head of Indonesia Susilo Bambang Yudhoyono to the President Ts.Elbegdorj and underlined the opportunity of cooperation in tourism, culture and light industry. Ambassador also expressed that the two countries have same position on democracy, regional security and sustainability. Mongolia has been working to participate regularly in the East Asian Summit since 2005 and in the same year joined the ASEAN Treaty of Amity and Cooperation. Ambassador of the Swiss Confederation to Mongolia Mr. Jean-Jacques de Dardel emphasized the 50th anniversary of the establishment of diplomatic ties that marks in 2014 and parties agreed the same position on developing the democracy value. Mongolia is cooperating with the Swiss Agency for Development and Cooperation SDC and in frameworks, sides have implemented the project on "Combating Human Trafficking in Mongolia", although Foreign Minister L.Bold sent a Letter to the Head of the Department of Foreign Affairs Didier Burkhalter to continue the project and now parties are considering the issue. Ambassador of the Republic of Suriname to Mongolia Mr. Lloyd Lucien Pinas is the first envoy to represent his country to Mongolia, where the two countries have established the diplomatic relations on September 27, 2013. This is the 172nd nation established diplomatic ties with Mongolia and the 26th country from Latin American continent and during the meeting, newly accredited Lloyd Lucien Pinas noted that his is the first Ambassador to start diplomatic relations between the nations and the two countries have opportunities to collaborate in mining, tourism and agricultural sectors. March 16 (UB Post) Minister of Culture, Sport and Tourism (MCST) Ts.Oyungerel and Chief of the State Property Committee (SPC) D.Tsogtbaatar officially reported that the former Lenin Memorial Museum building has been successfully transferred back to state ownership after many trials in primary, appeals and supreme court on Thursday. It is the only building originally built for museum operation in Mongolia and the much-awaited Central Dinosaur Museum will open there on June 1, now that the ownership issues have been settled. The MCST and SPC have been trying to take back the former Lenin Memorial Museum from the Mongolian People's Party (MPP) through a series of court trials over the last year. The MPP postponed trials 11 times. Following is a brief interview with Minister Ts.Oyungerel about the news. -How do you feel now that the museum building is in the hands of the state after much effort by you and your colleagues? -We are so delighted that the complaint was finally addressed. MCST requested that the SPC file a complaint to return the museum building to state ownership on March 1, 2013. The building was constructed, owned and financed by the ministry at the time, so MCST had full rights to regain its ownership. I'd like to express my sincere gratitude for the SPC, Mongolian courts, and former Chief of the Building Order Division of the Mongolian court between 1974 and 1980 and senior official Batchuluun for cooperating with us on the matter. Documents that Batchuluun had been keeping helped us a lot in winning the case. -When exactly will the Central Dinosaur Museum open? -The court decision is effective from today (Thursday). The SPC will officially organize an ownership transfer ceremony for us. We will immediately start our work to make the building a museum filled with magnificent, Mongolia-originated dinosaur fossils and related artifacts once we are handed the key. We have already formulated our rules and ordinances on redesigning the first phase of the halls. Despite many time-consuming overhauls and redesign projects, we are planning to open the museum by Children's Day on June 1, this year. I am sure that young children are looking forward to seeing the Tyrannosaurus bataar fossil. -How much is planned for the required budget before the launch? -It has been impossible for us to estimate the budget as we were not allowed to enter the building. Once we get the key, all the plans and budgets will be formulated, along with tender bid announcements. -How about the finds and artifacts to be displayed at the museum? -The first and the biggest display for the opening will be "Bataar and his Dad." The dad will be the giant dinosaur which was previously displayed at the Mongolian Natural History Museum (currently under repair). Old finds of dinosaurs will be displayed at the museum as well. Around 100 dinosaur fossils and other finds will be available for display at the museum, but the number will increase in the future. Warrior's reputation is one of a ruthless tyrant but some Mongolians believe he has been misunderstood. March 6 (Al Jazeera English) Mongolian warrior Genghis Khan built one of the largest empires in the world. He is known as a tyrant responsible for the deaths of millions of people in the 13th century. Some Mongolians, however, believe the world has misunderstood their great leader.